John Marshall brings a rare hybrid of racing and gaming expertise to lead Virginia operations for Colonial Downs Group. Over the past 20 years, John has gained unique experience building teams to open and optimize alternative gaming in racetrack environments across three jurisdictions. John was actively involved in introducing racetrack-gaming to markets in Pennsylvania, Florida and Ohio. 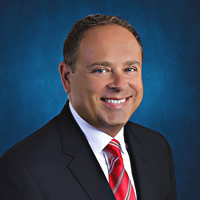 He has held senior executive roles during the evolution of pre-development, opening and optimization of racing, gaming and OTB operations at The Meadows Racetrack & Casino, Calder Casino & Race Course and Miami Valley Gaming & Racing. These experiences have prepared John well to introduce horse racing to new audiences in Virginia through the re-vitalization of Colonial Downs and introduction of Rosie’s Gaming locations. John’s passion for combining the thrill of horseracing’s “stretch call” with the excitement of a winning gaming experience transcends through his team to each guest and horse racing enthusiast. Instilling this energy into his teams has translated into immediate business results during his career. His collaborative inclusive nature has made long-lasting immediate impacts and led teams to achieve uncommon success in the form of enthusiastic openings, continual market share growth and industry recognition. John’s affiliations with Churchill Downs and Stronach Group properties have offered unique opportunities over the years, including multiple assignments supporting the Kentucky Derby, the Preakness and the Breeders’ Cup at Lone Star Park. John has been an advisor to start-ups and served as consultant to domestic, tribal and international gaming and racing interests in the areas of operations, market analysis, merger and acquisition research. He gained international experience in Latin America launching a successful simulcast venture and performed as consultant to Palermo and Maronas properties in Argentina and Uruguay. Other fun experiences include a cameo role on an episode of Undercover Boss and producer credits for the motion picture Amazing Racer. John earned his MBA from Waynesburg University and undergraduate from Indiana University of Pennsylvania majoring in Business and Accounting. John, his wife Tracy and daughter Julia are Pittsburgh natives who currently call Richmond home.